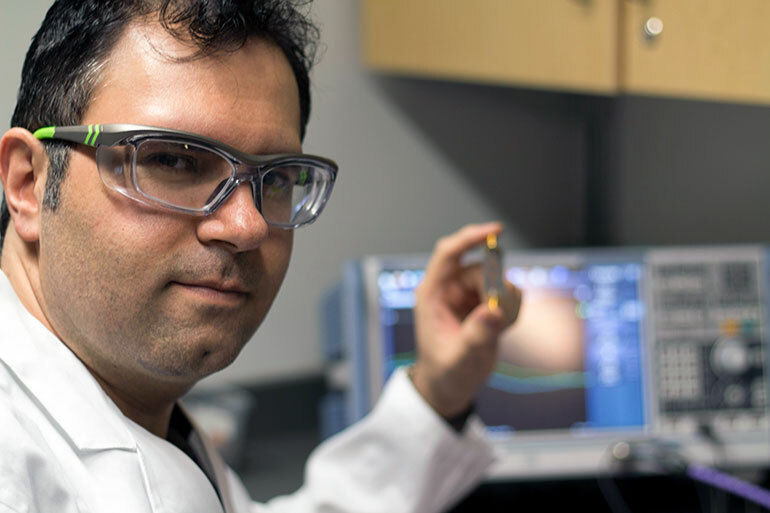 Mohammad Zarifi, an assistant professor at UBC Okanagan, shows his small biosensor that can be used to provides health care practitioners with a real-time diagnosis of a bacterial infection. Using a small and inexpensive biosensor, researchers at UBC Okanagan, in collaboration with the University of Calgary, have built a diagnostic tool that provides health care practitioners almost instant diagnosis of a bacterial infection. The tool is able to provide accurate and reliable results in real-time rather than the two-to-five days required for existing processes that test infections and antibiotic susceptibility. “Advances in lab-on-a-chip microfluidic technology are allowing us to build smaller and more intricate devices that, in the medical research space, can provide more information for health care practitioners while requiring less invasive sampling from patients,” explains Mohammad Zarifi, an assistant professor at UBC Okanagan. According to health care statistics from 2017, every hour of delay in antibiotic treatment increases mortality rates by nearly eight per cent due to infection complications in the bloodstream. Zarifi, and his research group in the School of Engineering’s Microelectronics and Advanced Sensors Laboratory, tested their device by tracking the amount of bacteria present in a variety of samples under various scenarios. The scenarios resembled those encountered in clinical microbiological laboratories. By sending a microwave signal through the sample, the device quickly and accurately analyzes and then generates a profile of existing bacteria. The diagnostic tool not only provides a rapid, label-free and contactless diagnostic tool for clinical analysis but it also goes further, says Zarifi. This biosensor, explains Zarifi is a significant step forward in improving the complex antibiotic susceptibility testing workflow and provides a rapid and automated detection of bacteria as well as screening the bacteria proliferation in response to antibiotics. The research was published in the journal Nature Scientific Reports with financial support from CMC Microsystems and the Natural Sciences and Engineering Council of Canada.